MyDay Daily 90 pack 90 Lenses per box 8 boxes (4 per eye) Wear Schedule: Daily Replacement: Daily Lens Material: stenfilcon A Manufacturer: CooperVision Your eyes are working all day. Shouldn’t your daily disposable lenses, too? 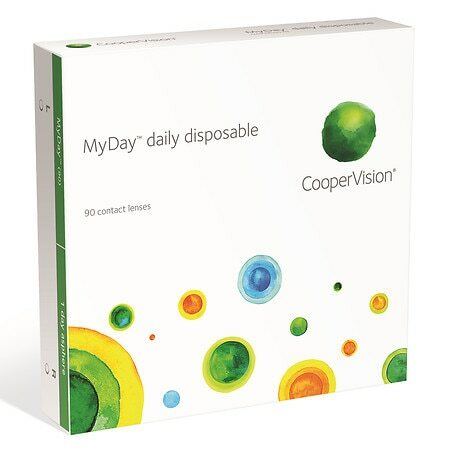 That’s why CooperVision® designed CooperVision®MyDay® to provide everything you need for an exceptional overall daily disposable experience: uncompromised comfort, easy lens insertion and removal, and a highly breathable lens that helps provides a healthier lens wearing experience. That’s MyDay—lenses you’ll put in and forget about until you’re ready to call it a day.